Jona, Switzerland: – Roller compaction and dry granulation leaders Gerteis Maschinen + Processengineering AG (Gerteis) is to host closely related expert seminars on their core technologies in mid-September. The first seminar (September 17-18, 2018) will promote deeper understanding of Roller Compaction Technology, closely followed by a further seminar on developing granulates with roller compaction technology (September 20-21). 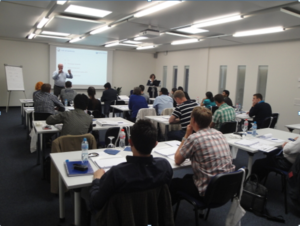 Both seminars will be conducted in English and hosted at the Gerteis headquarters in Jona, Switzerland, with overnight accommodation provided in nearby hotels. The first seminar on ‘Understanding Roller Compaction Technology: Theoretically and practically’ is intended for practitioners working in the field of Galenical development, process optimization and production. A series of lectures and hands-on sessions will provide the audience of up to 24 delegates with basic information, as well as in depth knowledge on dry granulation. The first day sessions will include an introduction to process principles, machine construction, functional parts, densification between rollers, and briefing on the variable gap principle, followed by ‘hands on’ session exploring the influence of gap and force on ribbon properties, powder draw -in and options to influence particle size distribution (PSD). Day Two will start with another hands-on session on monitoring granulate properties, control mechanisms, troubleshooting, scale-up aspects, technology and overall evaluation of the Gerteis Pactor©-and Polygran© roller compaction platforms. The second seminar on “Roller Compaction Trials in Development of Dry Granulates” is intended for those developing dry granulates for production, ideally with some experience with roller compaction. In both seminars, theoretical sessions are closely linked with the hands-on experience, using a Gerteis Mini-Pactor® to simulate lab scale conditions, scaling up to production scale conditions as modelled on a Macro-Pactor®. The intimate hands-on sessions, limited to six participants at a time, are intended to model real-life scenarios. Both seminars will also be addressed by a panel of expert speakers including co-founder of Solids Development Consult GmbH, Dr. Barbara Fretter. Dr. Fretter is noted for her academic studies on the deformation behavior of powders. The expert speakers will also include two Gerteis leaders: Dipl. Ing. Hartmut vom Bey who heads the company’s R&D department and is responsible for key technology projects and academic collaborations, along with Dipl. Ing. Herbert Holzinger, who leads the team supporting Gerteis customers with roller compaction technical issues. Click on Gerteis roller compaction and dry granulation seminars for more information. Email Michael Hanisch to book seminar places (up to three people per company).